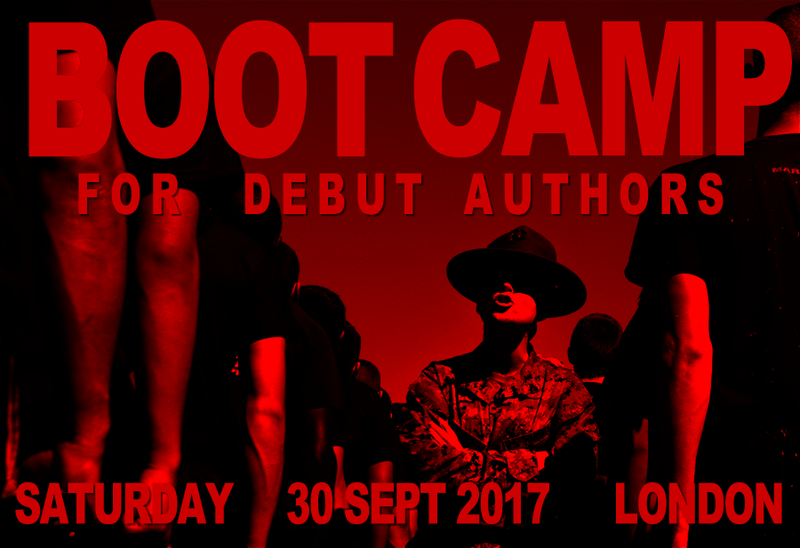 For the past two years now, I've been co-running a Boot Camp for debut authors with writing pals Sara Grant (Chasing Danger) and Mo O'Hara (My Big Fat Zombie Goldfish). The three of us bring useful skills from our real lives: Sara has worked in public relations and talks about strategy; Mo is a stand up comedian and an actress and talks about performance and school visits ... and me? Well I'm a former web designer and an all around geek – my role is to discuss how authors can take advantage of the digital opportunities available. Mo O'Hara discussing the art of the school visit. Sara Grant showing off her author kit in front of a board scribbled with the hopes and dreams of our audience. Here I am with a roomful of debut children's authors behind me. 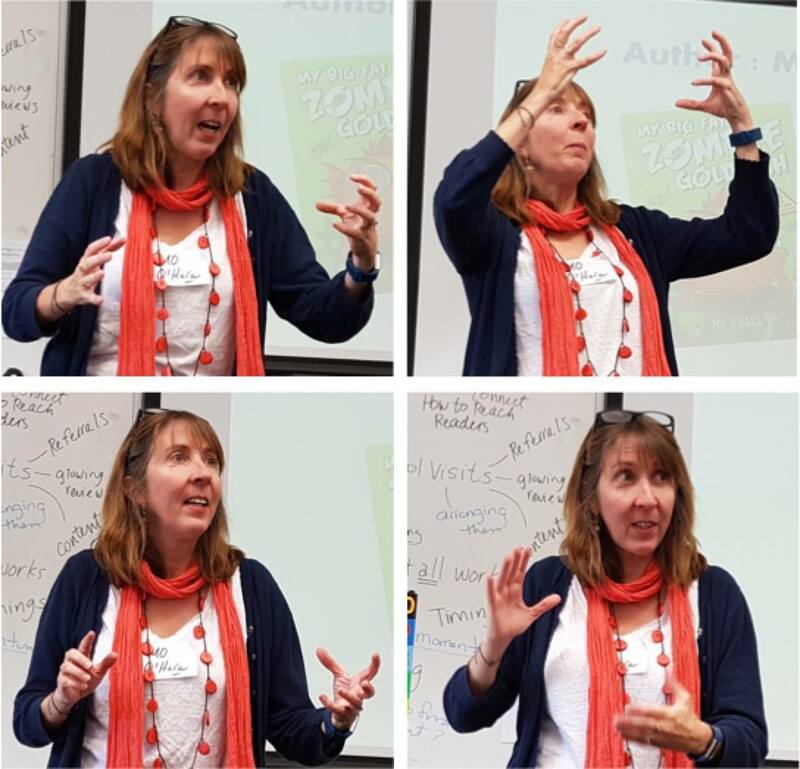 In past years, I have written a lot about author promotion, dishing out practical advice about websites, building a platform, how to do Skype visits, how to do Google Hangouts, how impoverished authors can make their own book trailers (part 1 and part 2), how to plan a book launch party and Facebook pages. The very nature of digital opportunity is so fluid, what with technology constantly changing, that the advice is never the same. Looking back at a 2011 post I wrote about building your own websites, for example, so much has changed in the online world that I should really put up a warning note at the top of the piece, pointing out that I wrote it six years ago. Six years is a long time in a digital world. Ten years ago, when the internet was just beginning to pick up speed, everyone suddenly decided that authors must blog. Well the graveyard of defunct author blogs is now full to overflowing as a result. Later, Twitter seemed to have The Power. Today, thousands of books are not getting written because their authors have become Twitter addicted. While Twitter is a social network that connects individuals, it's not a great place to actually sell books. And then there's Facebook, virtual hang-out to two billion of the world's population. At the beginning, Facebook introduced the 'fan page' – a thrilling way for authors to connect directly with fans who are on Facebook. Soon though, Facebook decided to 'monetise' fan pages via what one pundit called a 'bait and switch' – hiding your FB posts from your fans so that you will pay for them to be shown. I was so disappointed I wrote a piece declaring that there was no point having a Facebook page unless you're JK Rowling and your fans willingly visit your page instead of waiting for you to appear on their feed. So for the past few years, I've been using my personal FB profile, instead of an official fan page, to connect with my readers. But I kept an eye on Facebook. It's a no brainer that anyone wanting to be discovered should cultivate a good FB profile. But how? In December 2016, I noticed that under the relatively new button 'Following' on every Facebook Page, a new menu was popping up (pictured right). • They could UNFOLLOW your page so that they didn't have to see your postings, even though they liked the page. • They could tick DEFAULT and let the FB algorithm decide how much or how little they see of the page. 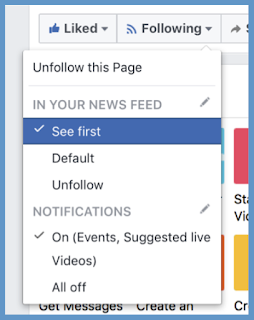 • Or they could select SEE FIRST so that they could see your all of the page's posts on their feed as soon as they are posted. Facebook was giving users a way to keep track of pages that they absolutely wanted to see. Yes, FB is still trying to encourage us to pay for promotions. But the social network has also realised that they have been alienating the people who create the content that makes the network social in the first place. For us authors, it gives us a fighting chance to be discovered. 'Always focus on helping the reader'. So what content can you create that will persuade your readers to click that SEE FIRST button? 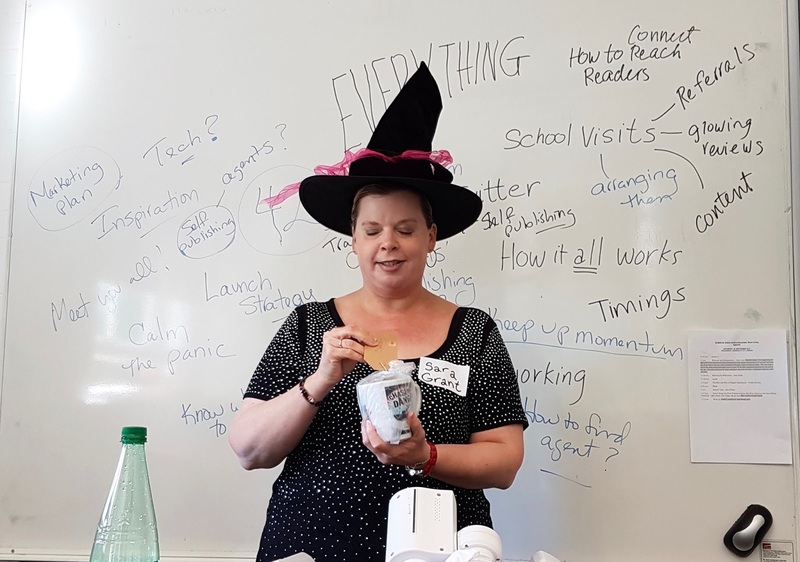 • Your identity as an author. • How useful/beguiling/compelling your content is to your reader. Considering your identity, it might help to see how other authors are playing themselves on Facebook - Junot Diaz posts about social and political topics, if you're a fan of Neil Gaiman, you get to hear that gorgeous voice and witness the disarray of his hair in his videos, John Green posts about nerdy stuff, Kate DiCamillo (whose readership probably most matches mine) posts inspirational stories. Me, I avoid politics but on my FB page, I comment on reading, writing and getting published (in childrens' books). As an 'author of colour' I am deeply concerned about diversity and inclusion. 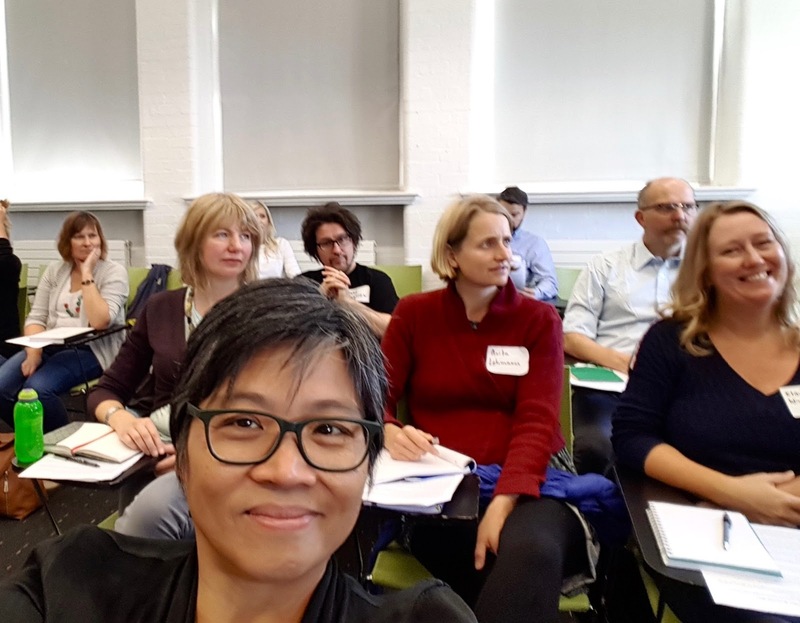 I use my skills as a former journalist to report on book events (you are welcome to read my blog post: Social Media: eight things we can learn from old-style journalism). It's also a chance to take photos and make videos (which I love!). As for adding value – never post in a vacuum! Imprint every posting with the value of who you are – with a comment, a thoughtful reflection, a wise interpretation, a personal anecdote. I only started my Facebook Page at the beginning of 2017 though I don't have a new book out until 2018. I thought this would give me time to get to grips with the page, create fresh content and build an audience. If you're interested in following my progress, please like my page ... I really try to be useful. Oh ... and don't forget to click on SEE FIRST. How is my FB page doing so far? Well, I'm feeling very positive. Videos are a big hit, especially if they're about picture books. I am trying to do quickie interviews with the interesting people I meet – most recently, at the Pune International Literary Festival in India (see the playlist) where I interviewed a range of fantastic folk, from student volunteers to venerable literary stars. The photo albums covering book launches (such as my friend Katy Dale's) and other booky events (like Melvin Burgess' nomination to the Hans Christian Andersen award, the Carnegie-Greenaway Awards, and the Dubai Literary Festival) attract many visitors (the secret is in the tagging – learn how to like other pages as your page). Some random visitors who come to look at pictures actually end up liking the page! I've noticed that the more original my posts – original here meaning, nobody else has posted it – the better it is received, with more likes, comments and shares. As for links posting, I am always on the look out for interesting links, and so I find myself following good pages that serve up useful information that suit my page's personality. For example, I love the posts on diversity by Lee & Low Books (a multicultural publisher in the US) and have reposted some of their links. One of the most popular links I posted was an article by the author Grace Lin discussing Dr Seuss's early racism in his work and how he changed. I had more than a thousand hits in two days. A photo of my feet in Little Prince Socks on the day I went to my first day as a judge on Booktrust's In Other Words Competition got thousands of views though only eight likes! Why? Still so much to learn. I'll report back in 2018 after my new books come out. Watch this space! 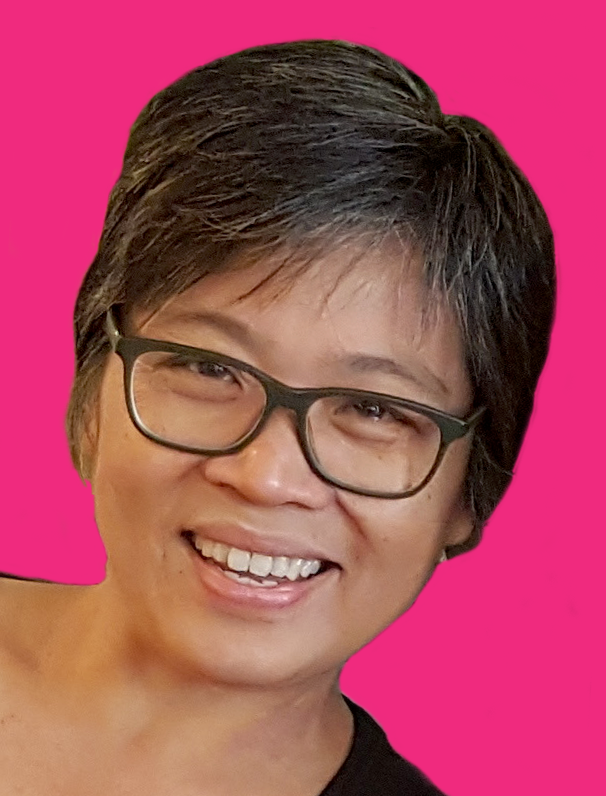 Candy Gourlay thought she could not become an author while growing up under a dictatorship in the Philippines and became a journalist instead – but she was wrong. Years later, her novels Tall Story and Shine have been listed for many awards including the Waterstone’s, the Blue Peter, the Carnegie and the Guardian Prize. Wonderful post, Candy! I find the promotional end of being an author to be a bit overwhelming, so the information here is generous and valuable. Thank you. You're right - technology changes so fast that good advice from a few years ago is quite likely to have become unhelpful by now.